Driven by the need to ensure it would be able to address the increased demands of the global trading landscape, with regard to both financial and social security, accession to international instruments – specifically those developed by the WCO, pressures from the trade to improve service levels, and the burgeoning demand to engage cross-border regional integration and international exchange of data, the South African Revenue Service (SARS) realized the need to revitalize its Customs functions. developing a culture within the organization that can innovate, learn, continuously improve, and act with integrity and professionalism. An ongoing review of its current 50 year-old legislative framework and the aforementioned context for change, created the platform for SARS’ Customs division to review its operations and engagement with stakeholders. As a result of the review, a radical overhaul of legacy systems towards a streamlined single integrated Customs information technology (IT) platform was considered. 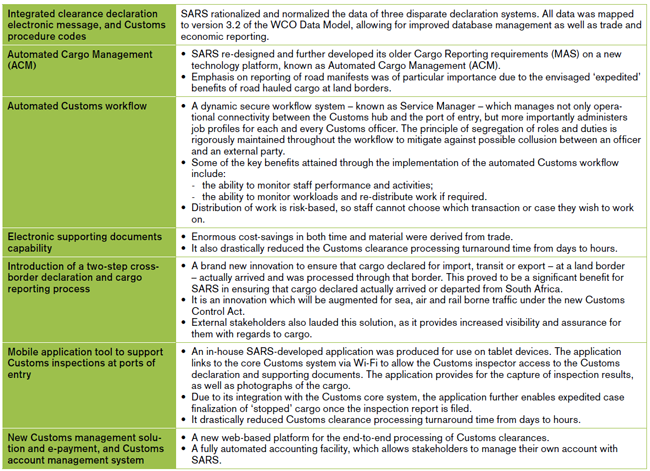 The acquisition of a new Customs solution in 2009 enabled SARS to explore, design and build a modern Customs automated solution based on the latest technology. At the same time, SARS had already attained much success with its suite of new technology services available to income taxpayers. It would, therefore, make fundamental investment sense to consider the possibility of how some of these services could augment future Customs capabilities and service offerings to the industry. The philosophy going forward would be to provide Customs’ users with a ‘step change’ in operational experience and performance. The emphasis, for the Customs officer, would mean a functional shift from non-value adding mundane activities to ‘risk-driven’ value-added processing and related services within a two-step capture, and authorize digitized quality processes. For this to occur, it would require an innovative approach by SARS to increase external trader participation and compliance in the submission of electronic transaction data. SARS was able to leverage off a well-established and committed trade community together with its equally adept plethora of information and communications technology (ICT) service providers. SARS’ engagement with its stakeholders adopted the slogan ‘Co-Creation’ – which simply implied that both parties engaged on solution designs, development timeframes, operational impact, and implementation readiness. From an internal SARS perspective, there lay enormous opportunity to re-design processes based on modern technology that would allow future scalability, agility and flexibility to meet the future demands of South Africa in international trade. The final outcome sought to place internal staff, as well as external trade, in a position of increased control over their respective activities, and offer greater predictability as to the outcome of a Customs transaction. Moreover, SARS’ stakeholder engagement encapsulated cross-border processing which required the organization to approach and engage its counterparts within the region. It was also obvious that the scale of change envisaged required an appropriate communication strategy, change integration plan, and post implementation support structure. In short, it implied changes to standard operating procedures (SOPs) and legislative changes, but most important of all, a completely new operating environment that would allow Customs officers to execute their tasks within a familiar user interface. Between late 2009 and mid-2013, SARS introduced a vast amount of digital innovation through solutions that would change forever the Customs and trade process. The benefits and improvements were in most instances immediate, as they were tangible. The resultant cost-savings to the South African supply chain logistics community was significant. 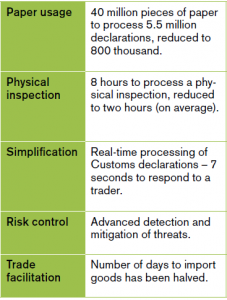 Through the elimination of paper for Customs clearances, and the new messaging and Customs status workflow, traders communicate electronically with Customs without having to present themselves physically to a Customs officer. Standardized clearance processing for imports, exports and cross-border countries are administered against a single data model, resulting in increased trade participation in electronic data interchange (EDI), and improved data integrity. ‘Digitalization allowed SARS to streamline its ability to capacitate staff and monitor workloads more effectively. It has also greatly assisted in the mitigation of possible collusion between staff and external third parties. The reduction in processing times, thanks to the new dynamic workflow and messaging environment, allow staff more time to apply their respective skill sets according to the role and function they perform. SARS acknowledges that, notwithstanding built-in electronic safeguards to mitigate elements of underhandedness, there are those who wish to manipulate the parameters of the system for self-serving ends. To this end, ongoing evaluation and review is maintained to improve security, and enhance training and integrity levels where necessary. proliferation of non-intrusive inspection technologies (NIIS) and Track and Trace tools to enhance control while providing efficient service. Start small, think big: big data!